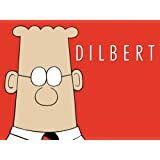 Dilbert premiered on UPN on January 25, 1999. The show is based on Scott Adams' hugely successful comic strip of the same name. Dilbert focuses on life in the working world of cubicles and bosses.